The chilly winter months are kind of a challenge for a lot of people. It gets dark earlier, there is less time in the day, and the weather is biting in much of the country, so we can’t just go for a nice jaunt outside when we feel blue. It’s a time when those grumpy feelings can really hit hard, leading us to snap at our loved ones, burrow into the couch, and feel like burying ourselves under the blankets until the warmth returns. However tempting it may be, that behavior is not particularly practical. Instead, we could try a natural antidote to our dreary feelings: eating foods that can cheer us up instead of dragging us down. Navigating the world of mood-boosting foods isn’t necessarily an easy task. We asked Michael Torchia, president and founder of Operation Fitness, a large-scale health and wellness conglomerate, to give us some tips on how to combat the winter blues. As it turns out, there are a ton of options that can help combat depression, if the problem is that serious, and improve your overall mood even if you’re just a little blue. Sometimes depression isn’t just about feeling sad; you can also be stressed, angry, or anxious. And when those feelings hit, there are definitely certain foods that can help. For example, if you are feeling sluggish and can’t quite concentrate, something leafy, like a spinach salad, will do the trick. If you’ve got a case of the blues, click through this slideshow and try one of our suggestions to help lift your spirits. It’s no secret that chocolate can be a miracle cure-all, at least in our heads. But using chocolate as a food to beat stress and depression might actually work. According to Torchia, “Experts say that chocolate — particularly dark chocolate — may help reduce the stress hormones that are swarming in your body.” So grab that chocolate bar and don’t be shy. 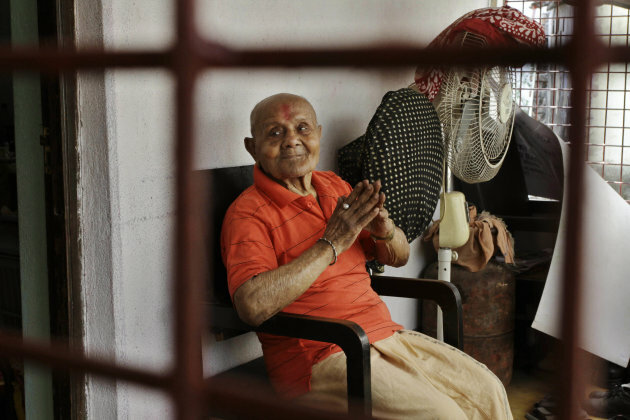 He doesn’t drink or smoke, and centenarian Manohar Aich credits his longevity to a healthy lifestyle in which he minimizes stress and focuses on happiness. Aich won the Mr. Universe international bodybuilding championship in 1952. He celebrated his 100th birthday on Sunday surrounded by children, grandchildren and great-grandchildren in Kolkata, an eastern city in India. Standing just 4 feet, 11 inches tall, Aich earned the nickname “Pocket Hercules,” the Associated Press said in a report. 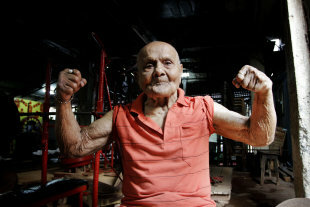 AP Photo/Bikas DasHis lifestyle and a simple diet of milk, fruits and vegetables along with rice, lentils and fish have kept him healthy, the bodybuilding trainer told the AP. Aich turned to bodybuilding while he was imprisoned in the 1940s for opposing Britain’s continued colonial rule of India. When he was released, he went on to compete as a bodybuilder, earning success in international competition that culminated with his taking the Mr. Universe title. While his wife took care of their children, Aich traveled, competed and made a living. On his return to India, he trained future bodybuilding champions. He has led a fulfilled life, but Aich regrets never having met his fellow Mr. Universe, former California Gov. Arnold Schwarzenegger. He’s seen many of the Governator’s films, though. “I like the incredible stunts he does in the movies,” Aich told the AP.